Have you ever had a moment where, after years of going back and forth, hemming and hawing, you finally take the plunge and do something you’ve always wanted to do? After years of curiosity, I took the plunge on a nice autumn afternoon last Sunday. 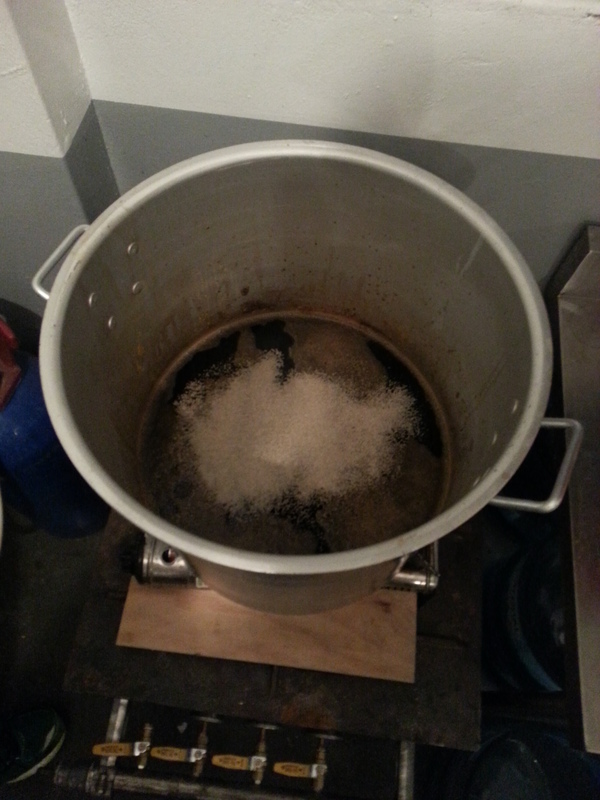 With some initiative from my friend Rob Shelley, I was finally going to learn about brewing beer! I had spent years talking about it, but brewing just seemed too complicated. Now I was going to find out if my fears were overblown. Rob and I had been talking about brewing for a while. 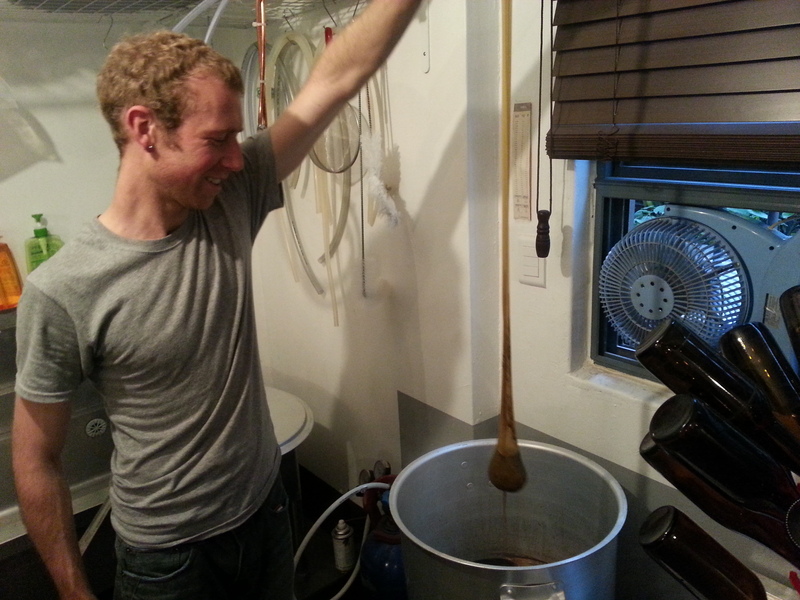 As a beer blogger, he felt that he needed some hands-on brewing experience to round out his knowledge of beer. 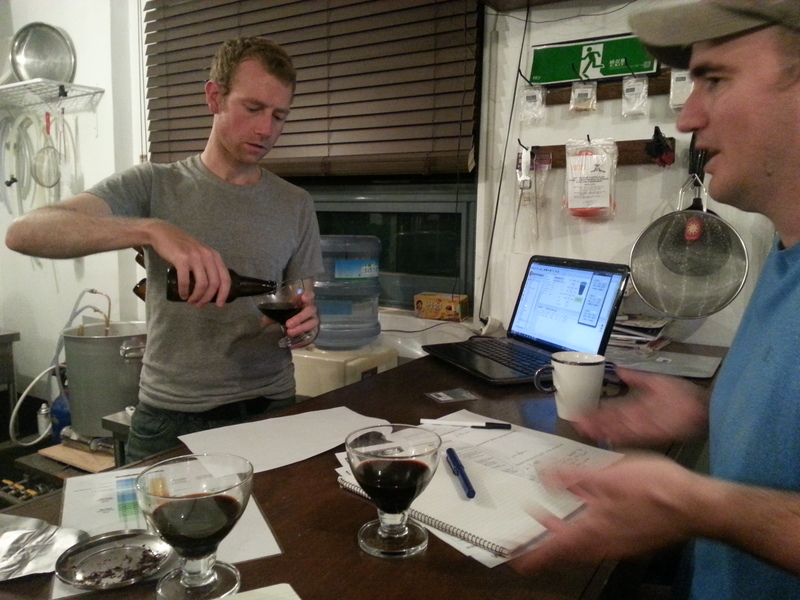 Rob had contacted Seoul Homebrew about their classes, but the normal teacher was out of the country. 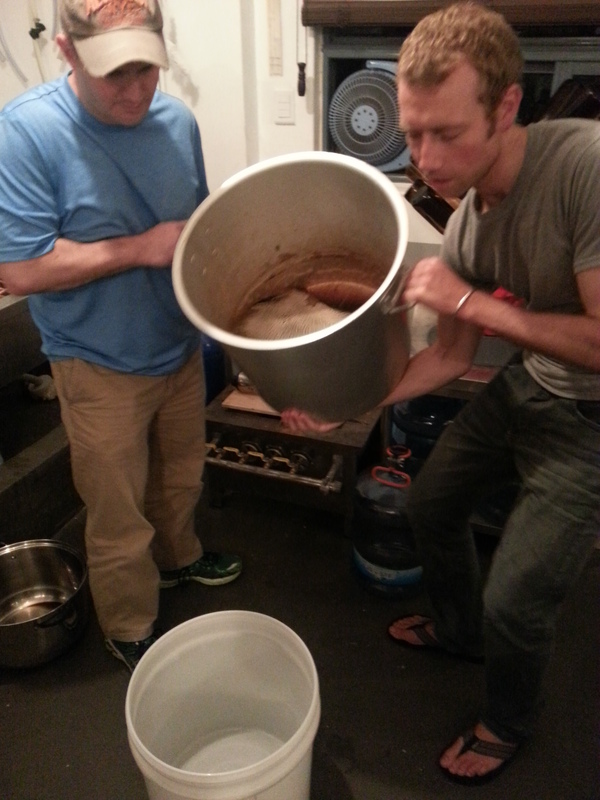 Luckily for us, co-founder Jonathan Wilson was about to brew a batch for himself, and offered to let Rob come along for a free lesson. Rob asked if I could tag along and boom: there I was about to go back to school! 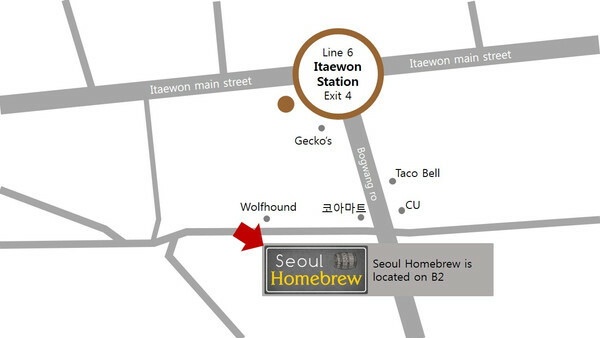 Seoul Homebrew is located in Itaewon on a small alley behind Geckos. 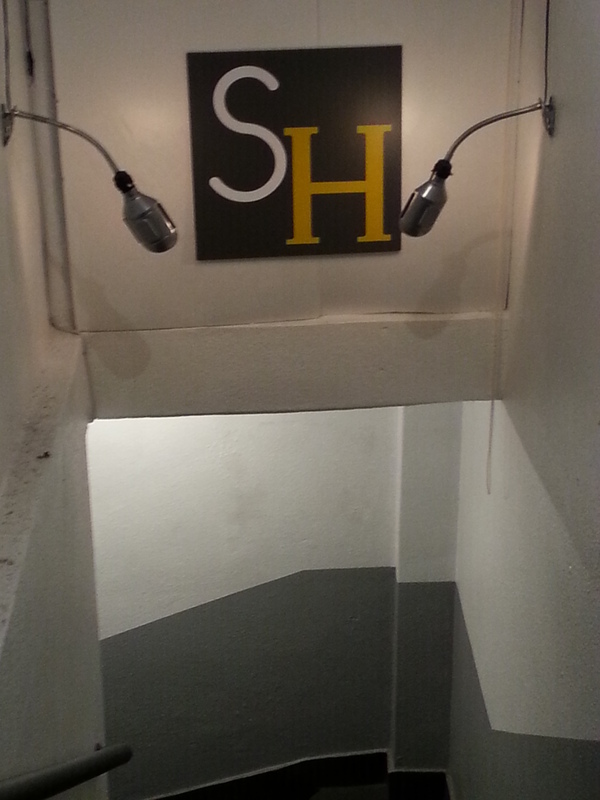 It’s in the building across from The Wolfhound, in a basement below The Four Seasons. 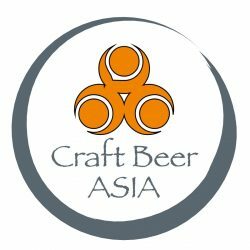 We avoided the temptation of The Four Seasons and their delicious selection of imports and homebrewed beer, and descended into the belly of the Seoul homebrew scene. 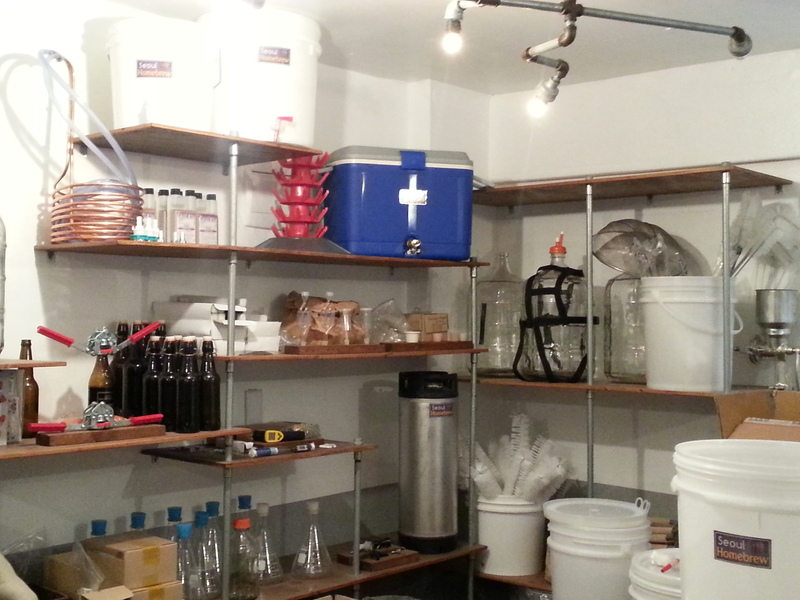 The Seoul Homebrew shop looks like a mash-up of warehouse and kitchen. 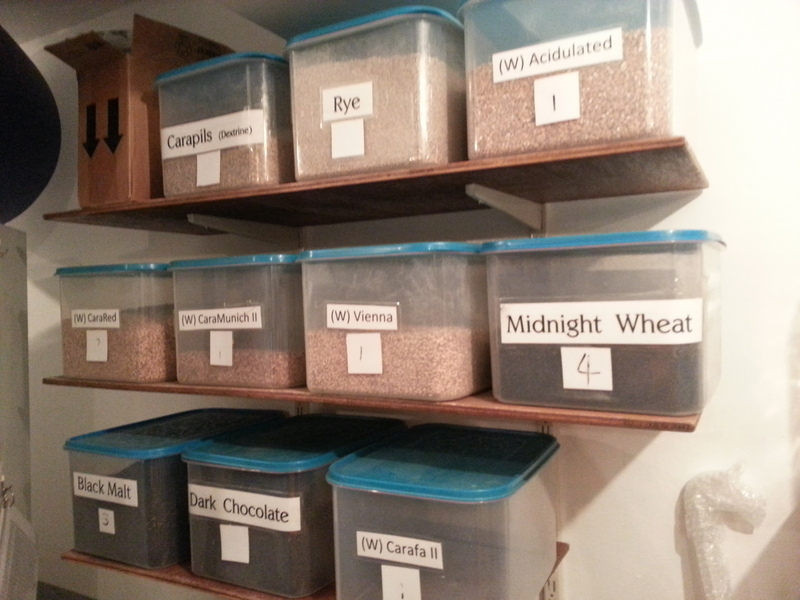 One part of the room is used as storage for ingredients and materials. The other part is a kitchen-like brewing area. The center of the small room is bisected by a bar made from a polished dark wood. 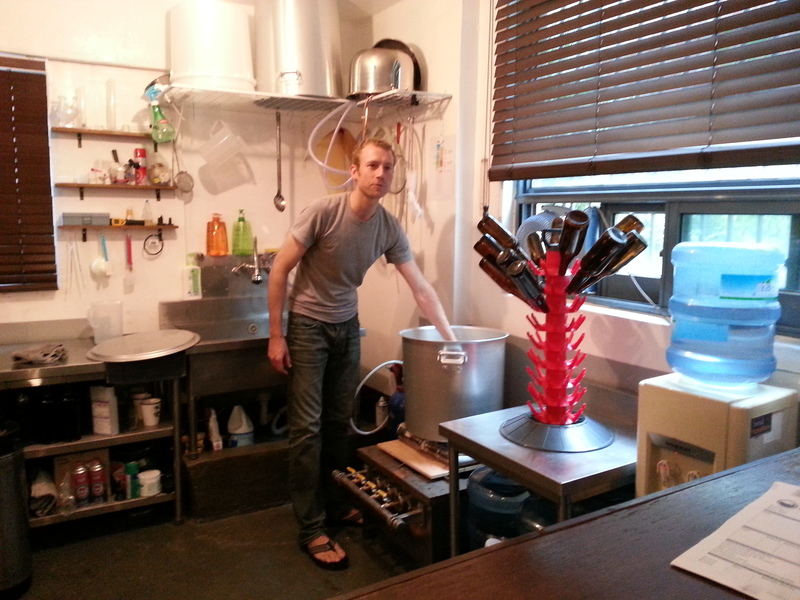 Our teacher, Seoul Homebrew co-founder Jonathan Wilson. Awaiting us on top of the bar was our first challenge of the day, a test! Right out of the gate, I stumbled. The first question asked what the four ingredients of beer were. 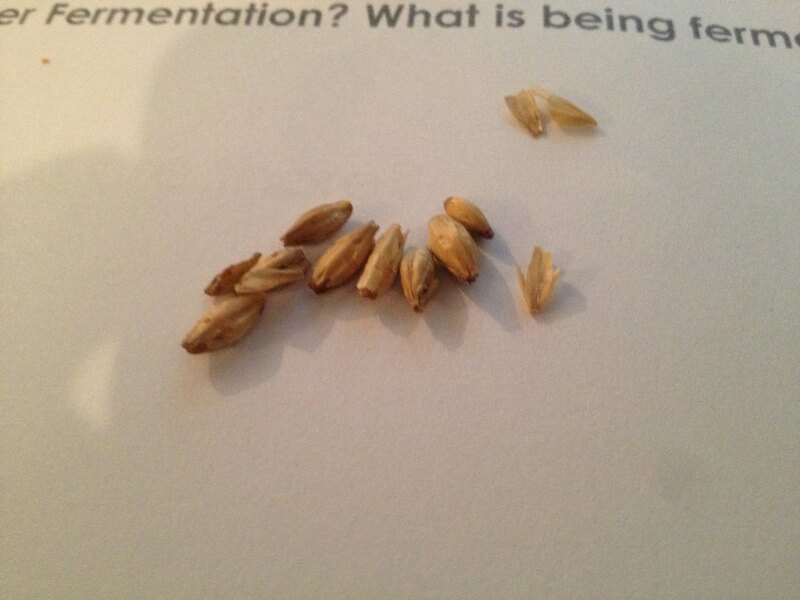 I answered with the ones I could easily taste: malt (or grains), water, and hops. I paused and racked by brain but couldn’t pull the last one out. I threw a Hail Mary pass and went for “time”. After some gentle teasing from Jonathan and Rob, I was reminded of the most necessary ingredient to be able to make alcohol—yeast! Jonathan proved himself a gentle teacher by handling my forgetfulness with an easy smile and straight answer. From there we covered more of the basics: what the ingredients do, how sugar is fermented into alcohol, and the role of temperature. After the preliminaries, Jonathan got us to scoop and weigh several different malts while explaining their flavor profiles. We had fun tasting and smelling all of the types of malt that we were using that day: Pale Ale, Dark Chocolate, Carapils, Caramel 60, and Midnight Wheat. 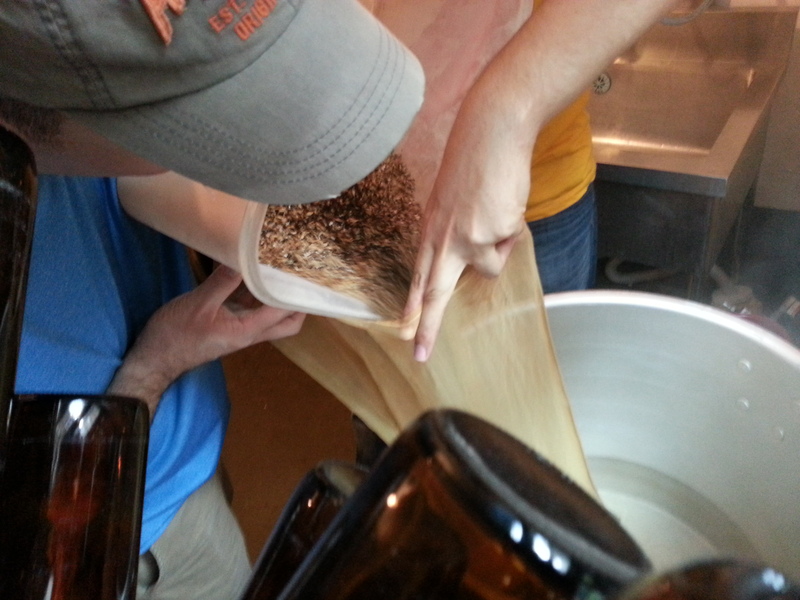 We also added some unmalted Roasted Barley. Rob and I got surprisingly addicted to the popcorn-like taste of malted and roasted grains. Tom scoops some Pale Ale malt. 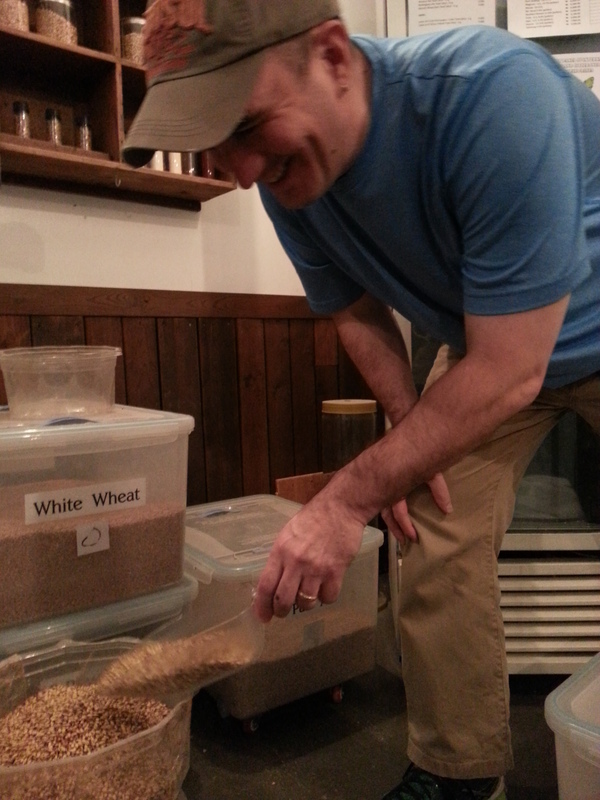 Rob pours the weighed malt into the grinder. Through each step, from measuring and grinding the grains, to checking the temperature, brewing the malt and extract, adding the hops, chilling the wort, and adding the yeast, Jonathan guided us deftly while letting us do as much of the work as possible. He took care of anything that was difficult or dangerous, but definitely treated us to a hands-on experience. This was great because it’s exactly how I learn best; I need to do the work to actually understand it. 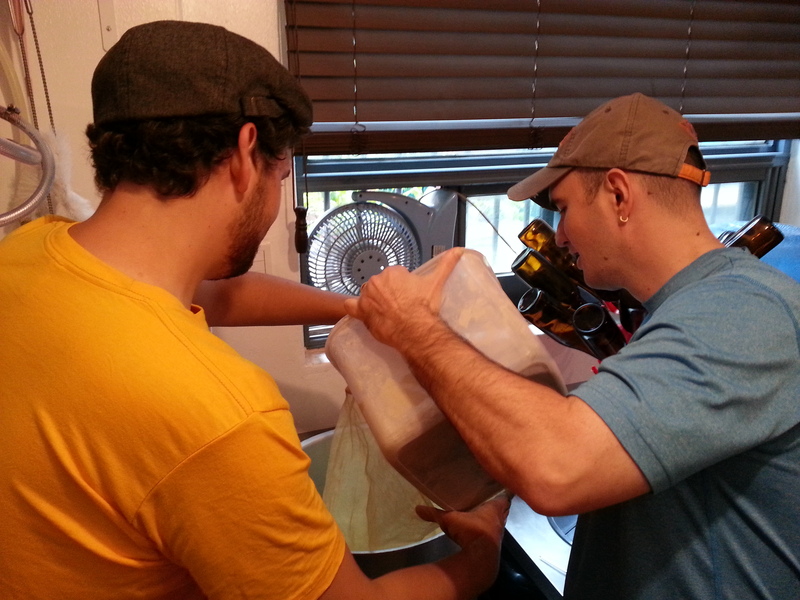 Teamwork as Tom and Rob pour the ground grain into the grain bag to steep in the hot water. 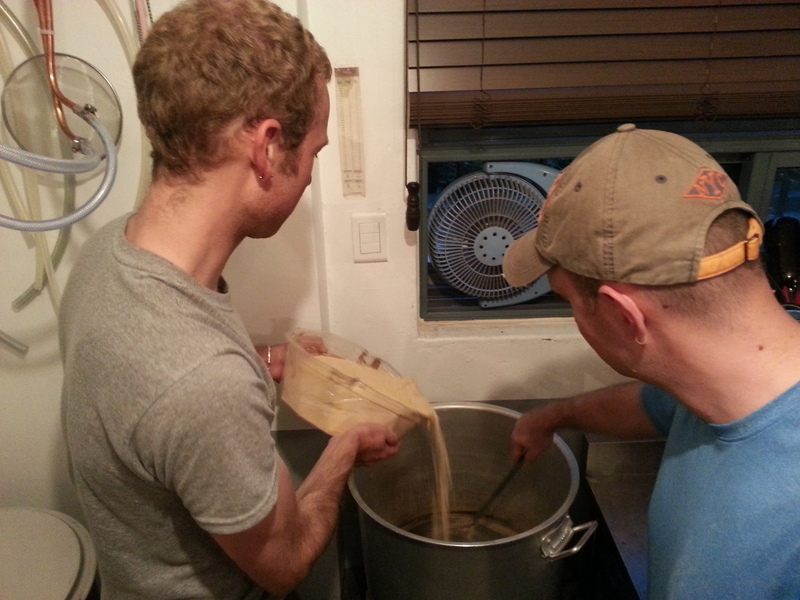 Jonathan and Tom put hops into some pantyhose to steep into the wort. Hops can be added at different times and in different amounts depending on how much flavour or bitterness you want. 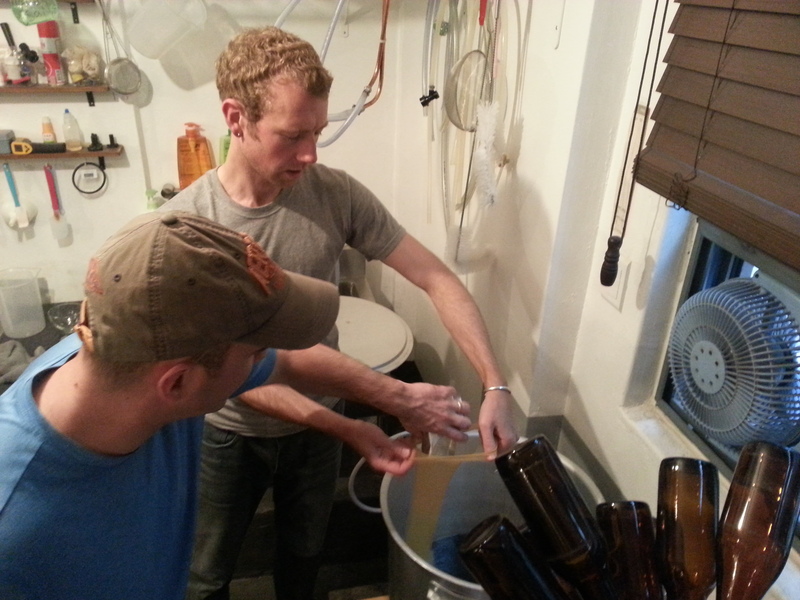 Normally for these classes, students brew a Pale Ale. 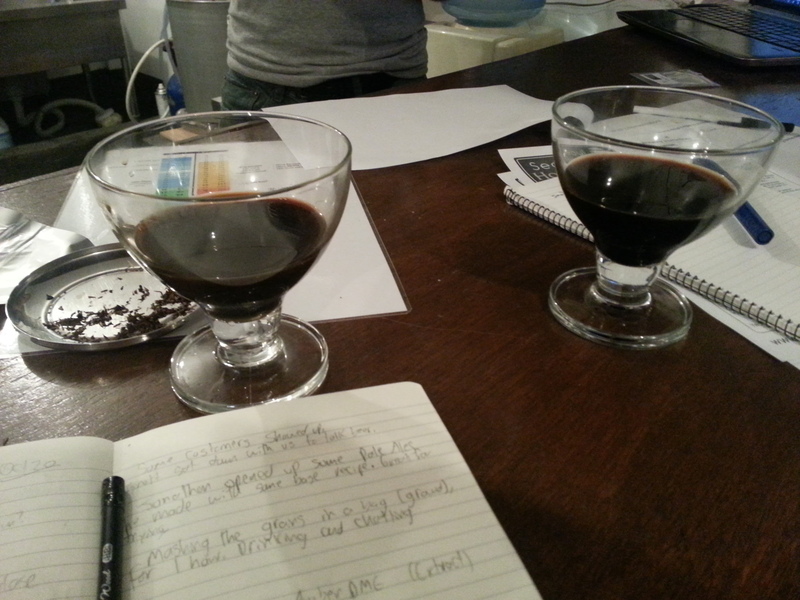 However, as this was Jonathan’s personal brew, he walked us through making an Imperial Stout with the partial extract method. 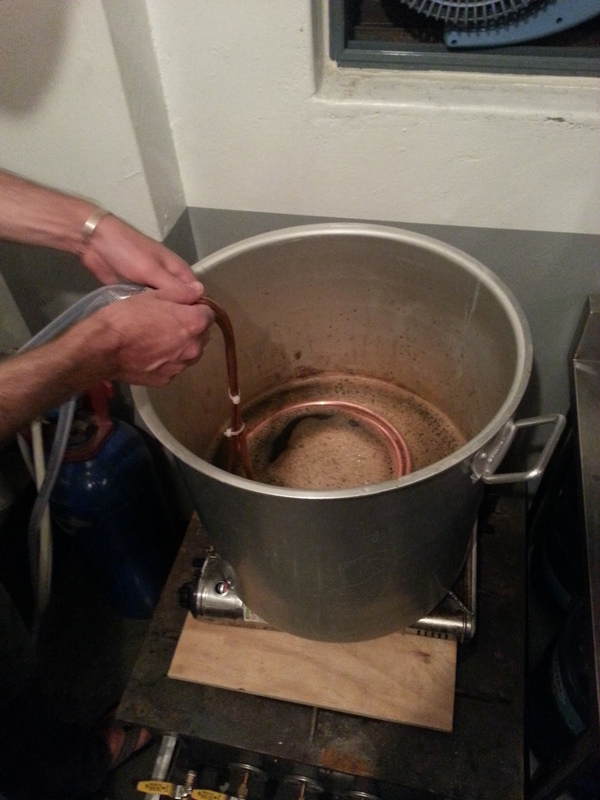 The partial extract method (or partial mash) was perfect for us because it combined the two main ways of brewing: the more technical all-grain mash and the pre-packaged extract brewing. 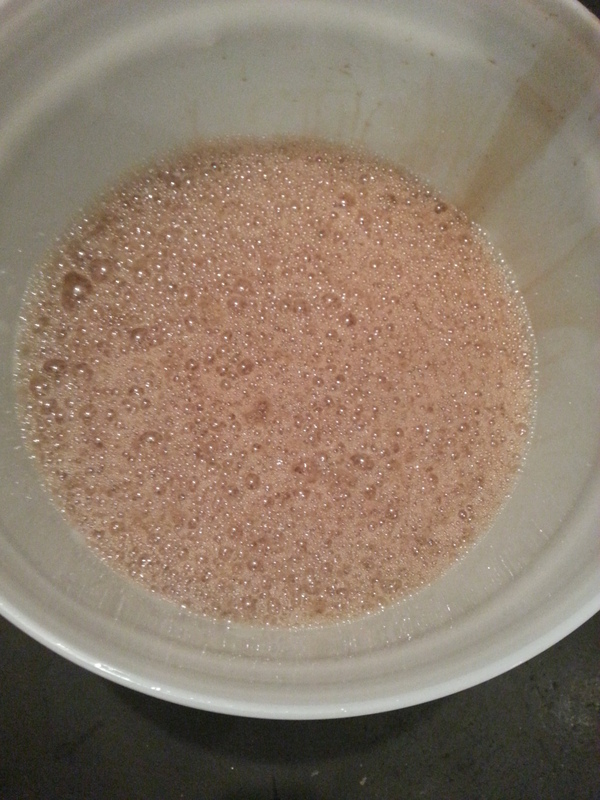 The extract brewing is easier because someone has already done the hard work of extracting fermentable sugars and packaged it in powder form. We simply throw it into the hot water! 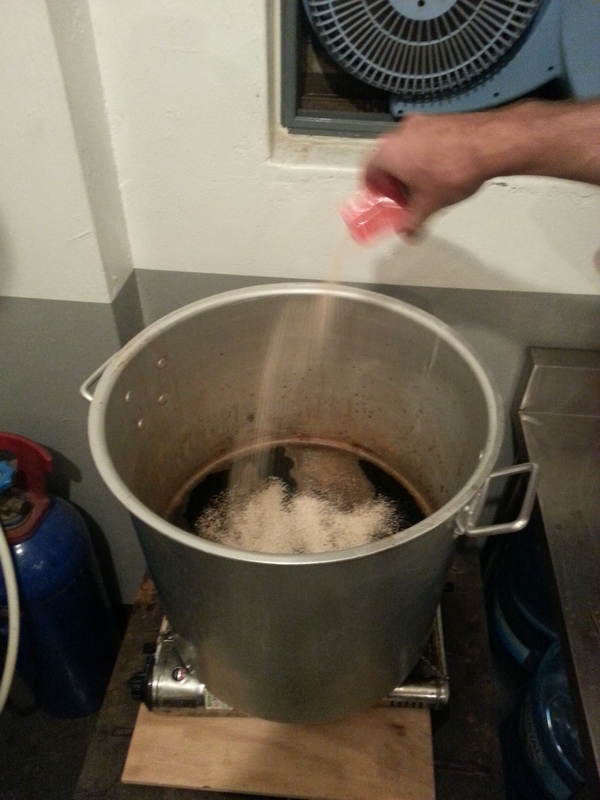 This extract will give us most of the fermentable sugars we need to make alcohol, while the grains will give us the color, flavor, and mouthfeel we want. Jonathan with the pre-packaged extract. 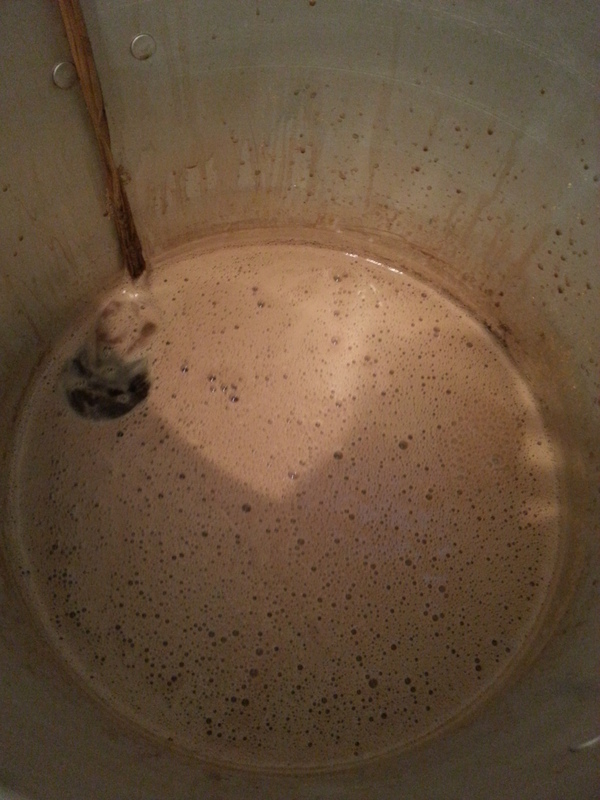 This will give the wort lots of extra fermentable sugars that the yeast will eat a turn into alcohol. 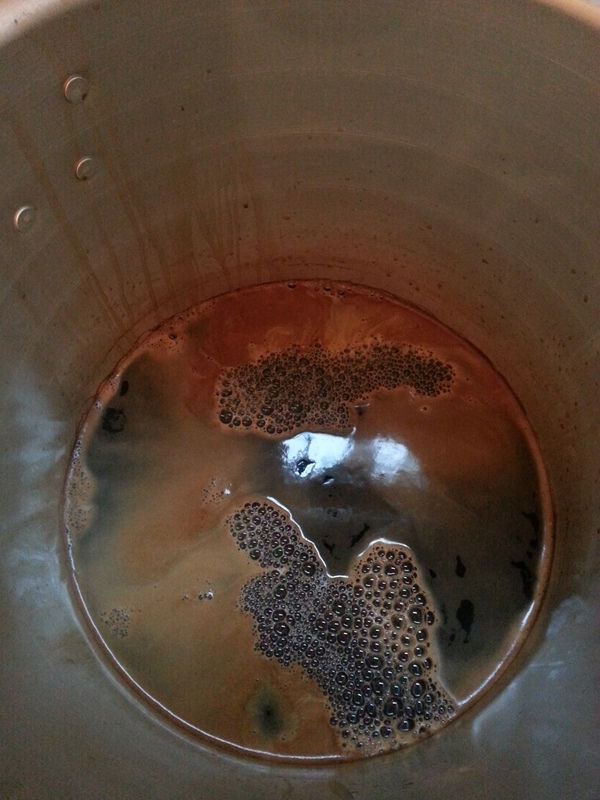 Jonathan’s Imperial Stout is aiming for about 7.5% abv. Yum! During the time we spent waiting around while the brewing happened, which is most of the brewing experience, we did what any professional brew master would do: we talked and drank. Jonathan explained more about what we were doing and why. He was also as generous with his homebrew as his was with his knowledge. 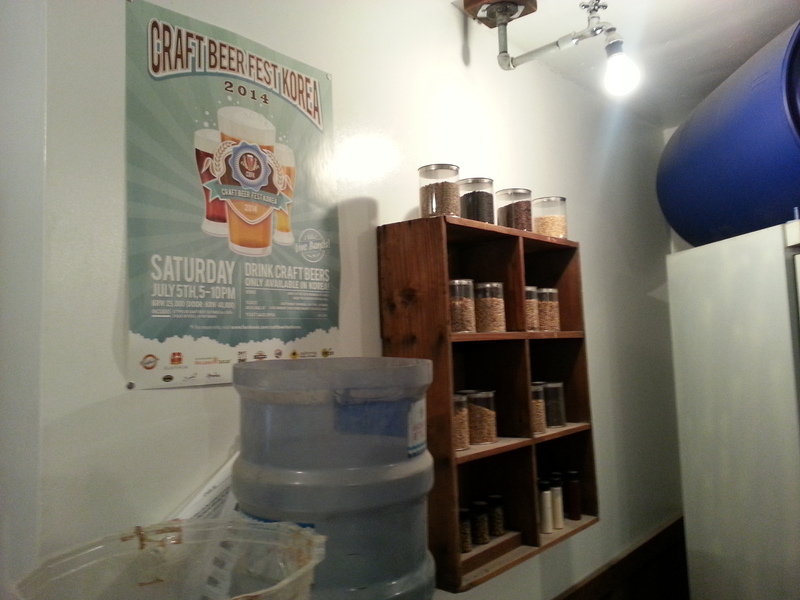 We tried several different beers, some that were stouts and others that were pale ales. 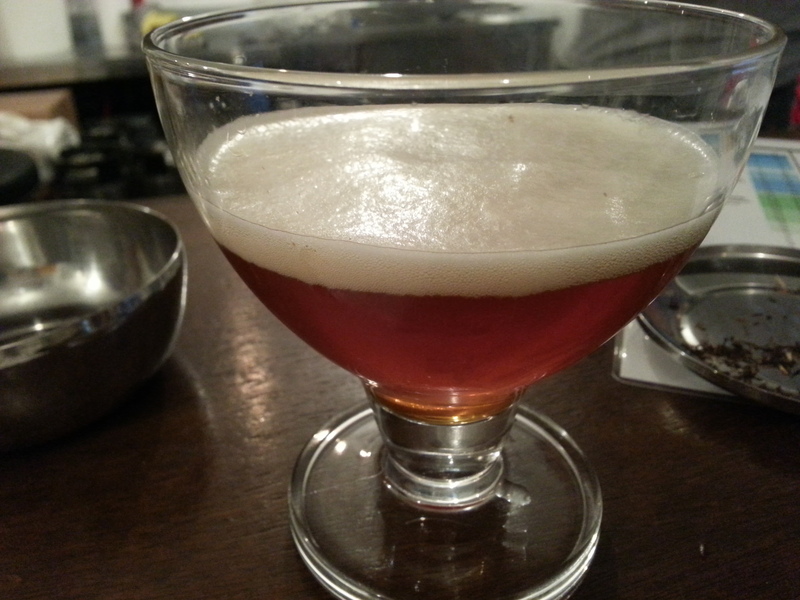 The pale ales were interesting because he had brewed several beers with the same recipe, changing only the type of hops. 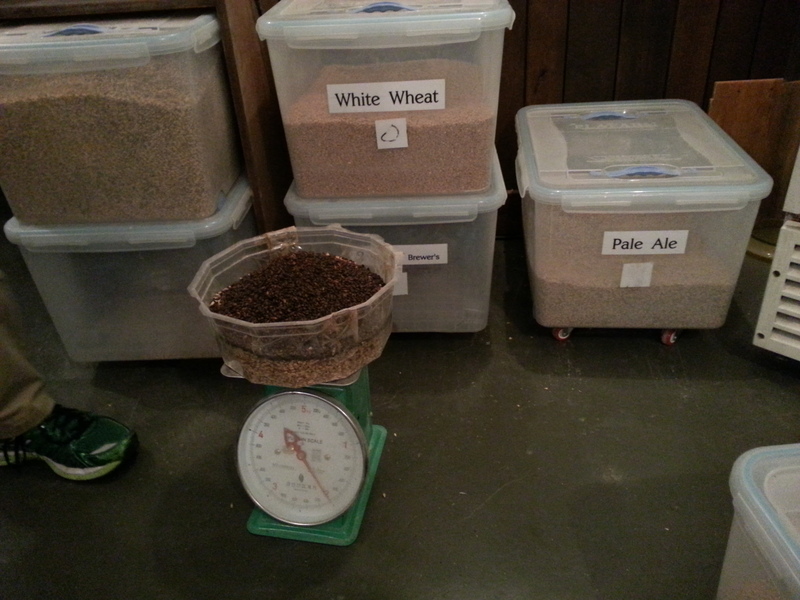 This allowed us to contrast the different flavors and aromas that different types of hops create. Brewing is thirsty work. Luckily, Jonathan is as generous with his beer as he is with his knowledge. Adding to our fun and education were several drop-ins throughout the day. 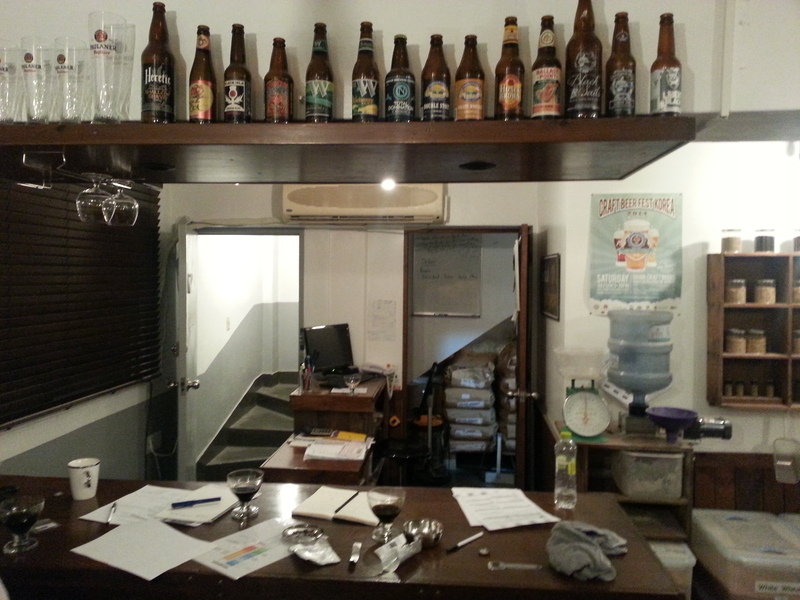 Seoul Homebrew is a very inviting place for beer enthusiasts. Early in the afternoon, we had two gentlemen who were confused about what the place was and had already had too much beer to hear Jonathan’s invitation to sit down with us for a drink. Then an experienced home brewer named Brett stopped in to buy supplies, but stuck around with us for a few glasses of homebrew. Brett added a lot to our conversations about home brewing. Later, Kim Man Jeh from The Four Seasons come down. 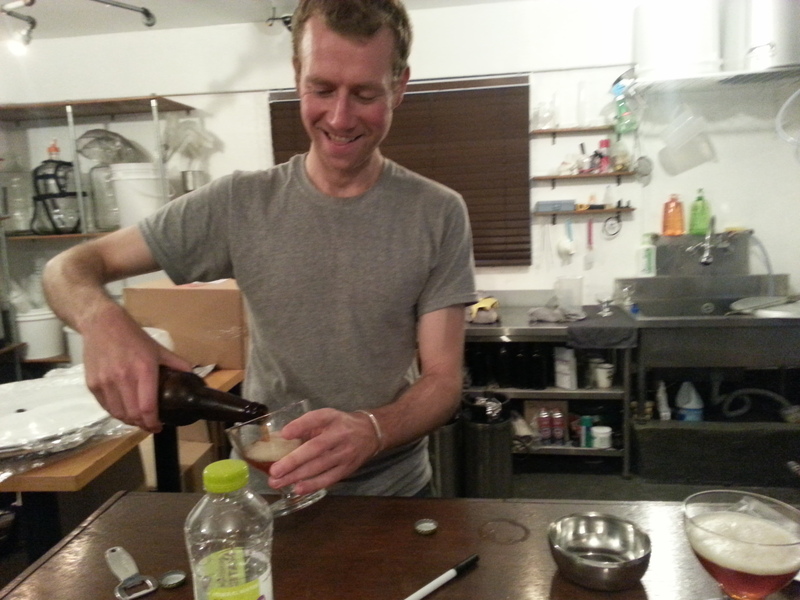 Man Jeh is a certified Brew Master, having trained in Germany, and often stops by Seoul Homebrew for a beer and a chat. We were blessed to have him there to answer questions about his experiences and get his opinions on the craft brewing scene in Korea. He also shared some exciting news: he’ll be the head brewer for a new brewery opening up in Busan! 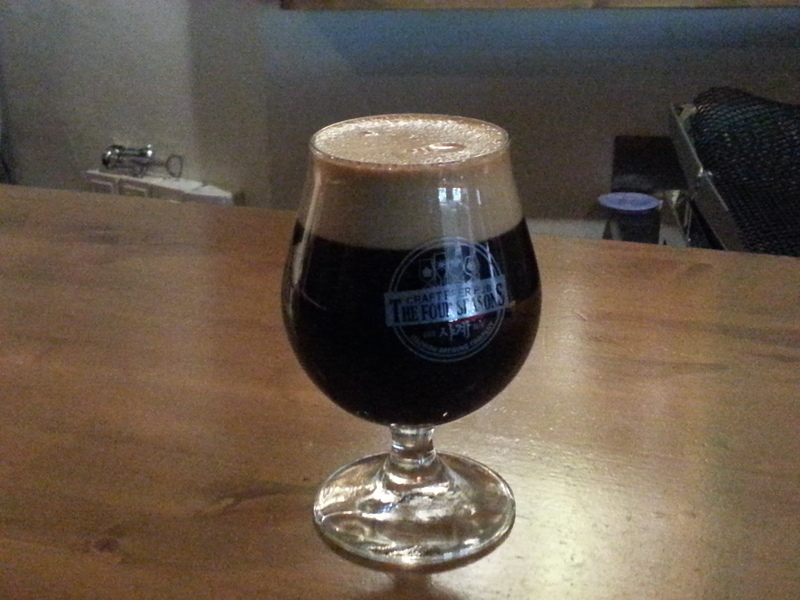 This is Kim Man Jeh’s amazing Coconut Stout that was previously available at The Four Seasons. It was one of my favorite beers! All in all, the whole experience was great. Jonathan is a great teacher and wonderful host. From my time working in a brew pub as waiter, I’ve gathered some sort of idea of the steps, ingredients, and materials needed for brewing. In a sense I knew all the words, but I hadn’t known the tune. 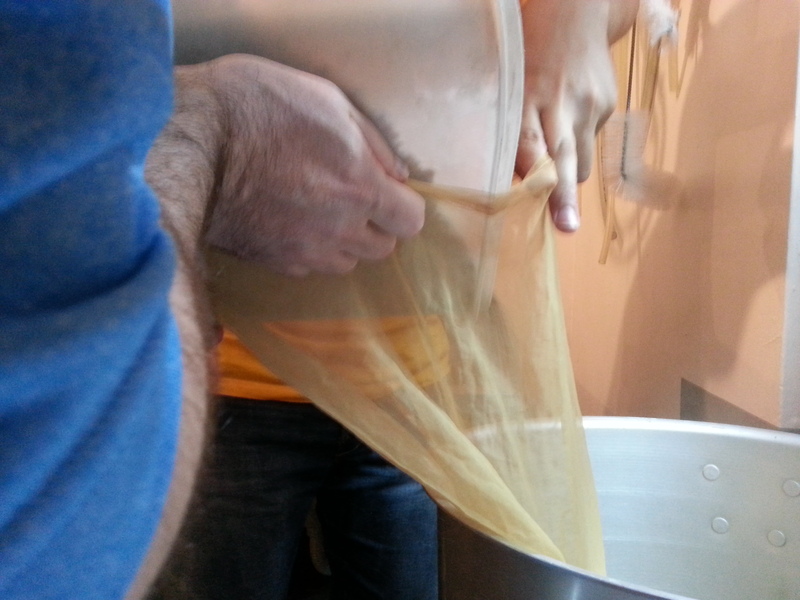 From Jonathan, I not only learned more about the process—I got to see, feel, smell, and taste the process, too! 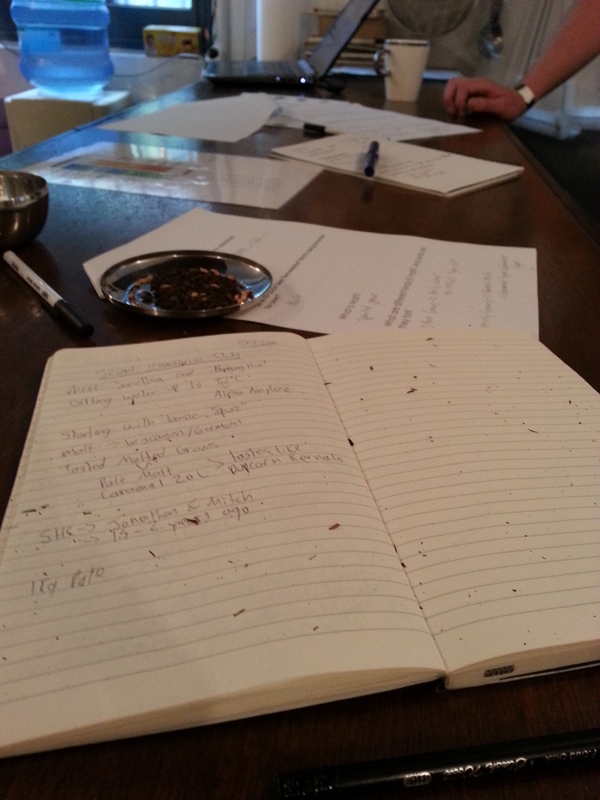 As the class and the brewing progressed, I started understanding more and more. 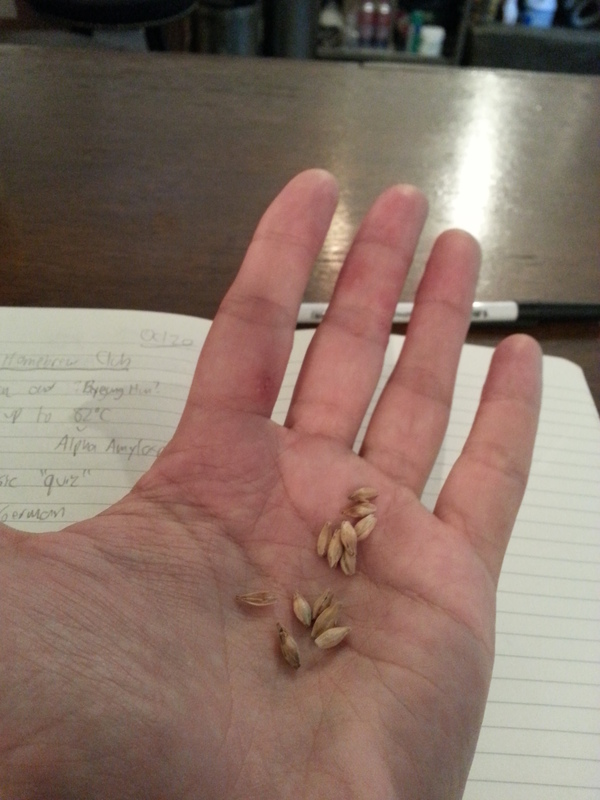 I learned about base malts and specialty malts. I learned about how adding hops at different times changed the taste. While I can’t say I am an expert yet, I am more knowledgeable about the process. My trepidation has been replaced by an eagerness to start brewing on my own. 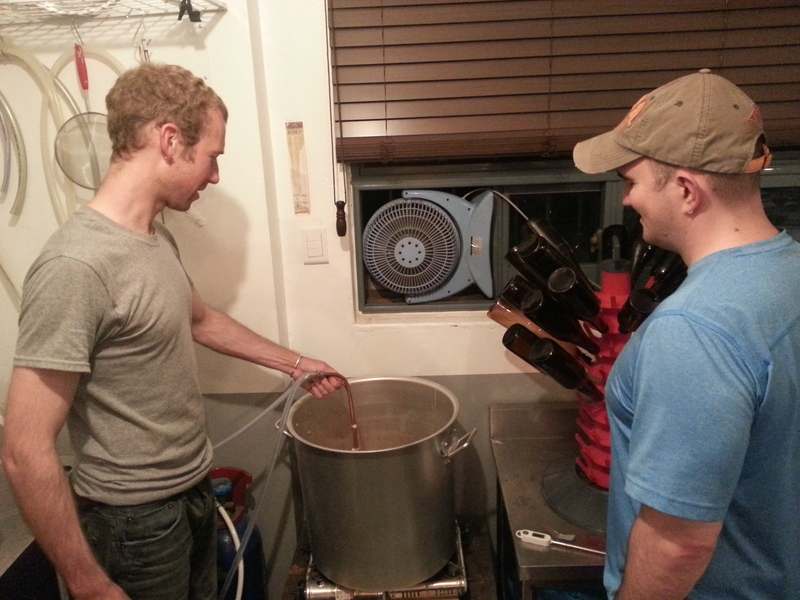 Jonathan and Tom with the wort chiller, which helps cool down the wort as fast as possible. 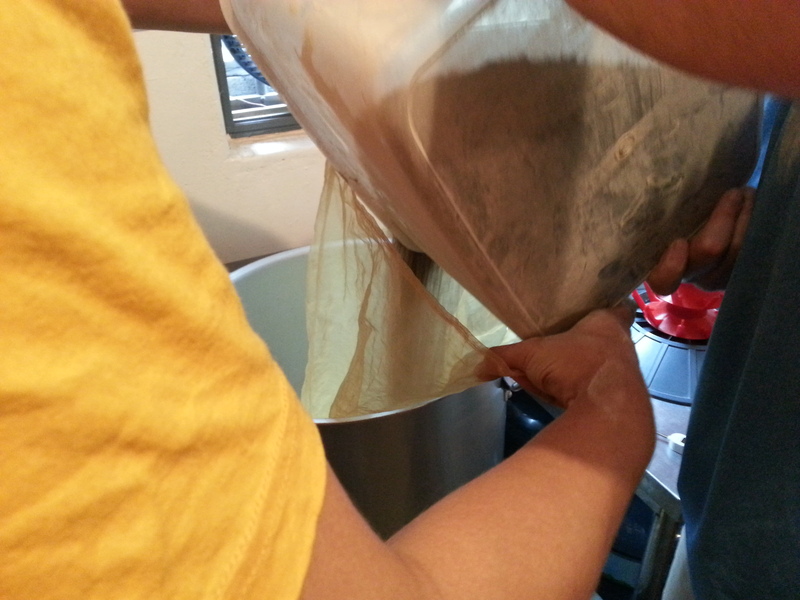 Adding the packaged yeast after the wort is chilled to the exact temperature Jonathan planned. Temperature can be experimented with for different flavors, but only within a certain range. 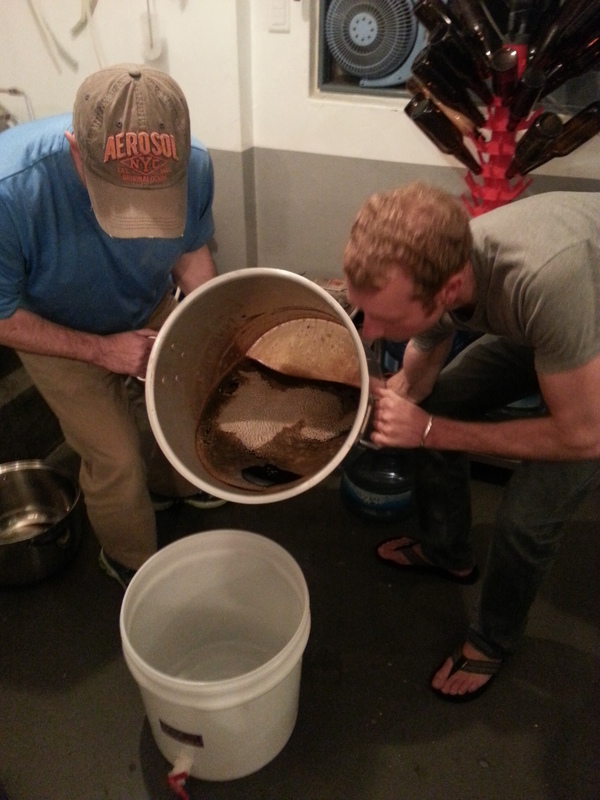 Adding the newborn brew into a freshly sanitized fermenting tub, made and sold at Seoul Homebrew. 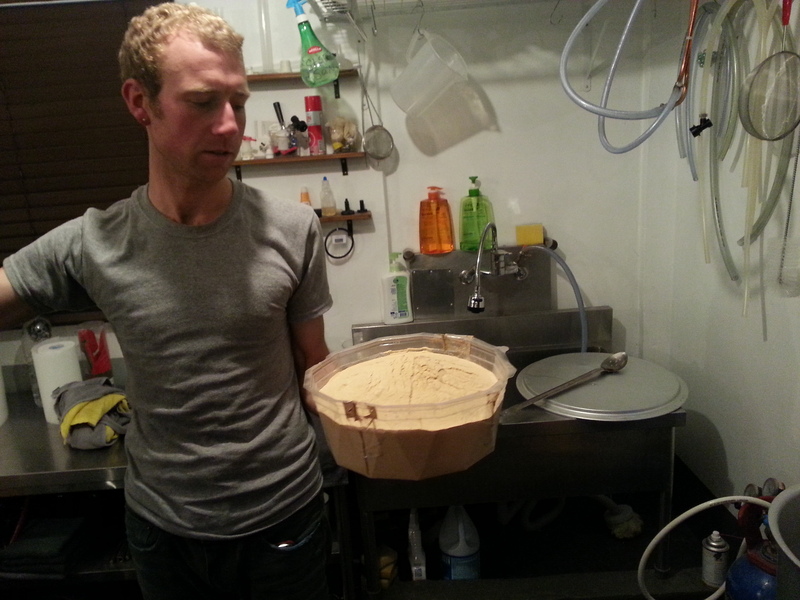 Jonathan wants a nice, frothy pour to give the yeast a little oxygen to help them do their heavenly work. This will be the last free oxygen they get, as Jonathan will cap the tub, shortly. Is it worth taking the class? Yes, it’s definitely worth it. 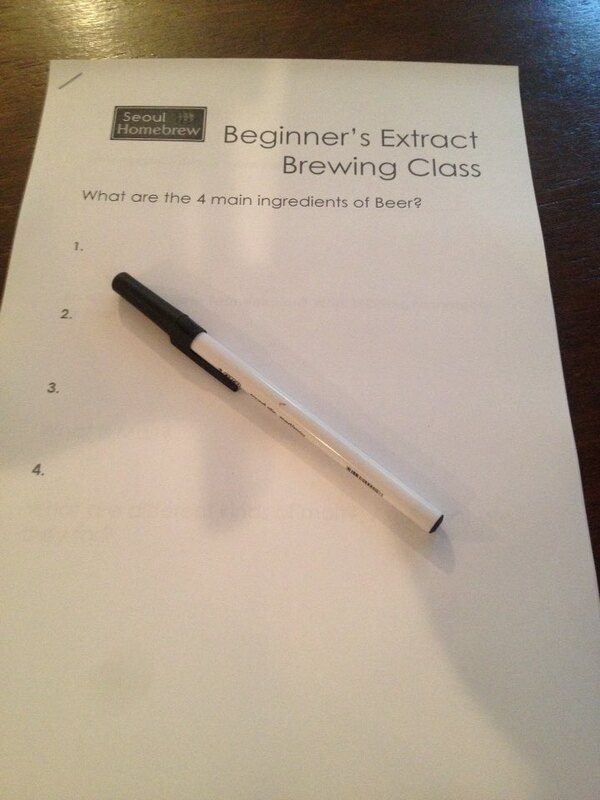 Furthermore, it doesn’t have to be a class only for those who are going to start brewing beer. This can be a great opportunity for someone who likes craft beers and wants to know something about them and the process. 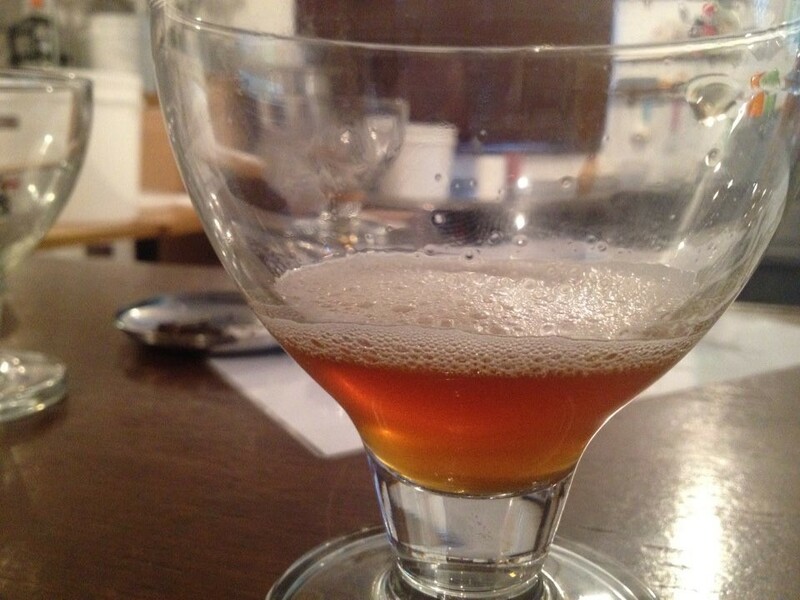 By taking this class, you’ll gain a deeper appreciation for the beers that you love. 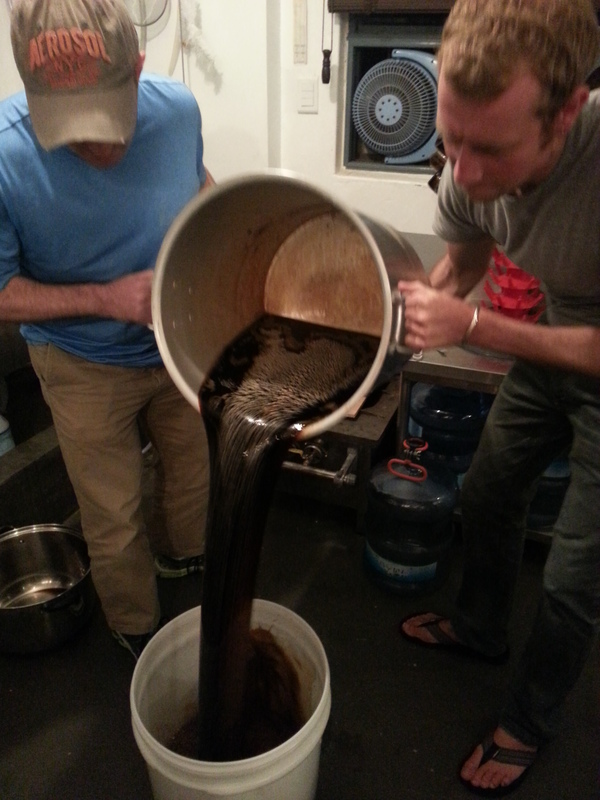 For myself and Rob, it kindled the fire in us to start brewing on our own. Jonathan removed any worries I had about making mistakes and helped me welcome the opportunity to find out what can happen if I take plunge for real. 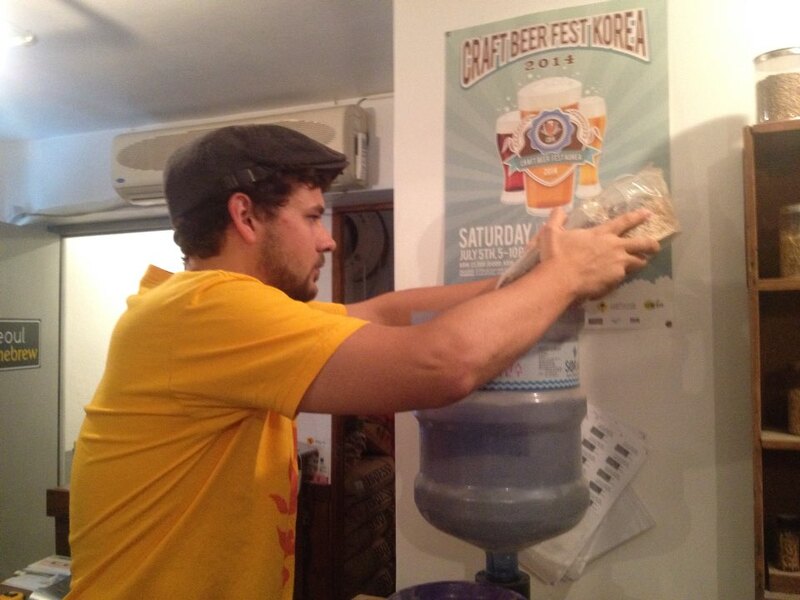 If you’re interested in attending the class, you can reach Jonathan at www.seoulhomebrew.com. There you can sign up for classes or order equipment and ingredients. 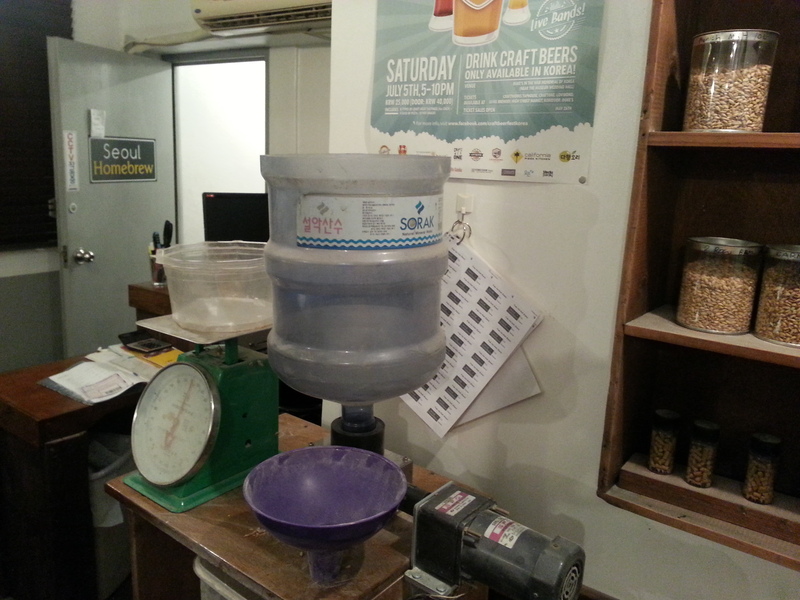 Classes start at 55,000won per person and include 5L of the beer you helped craft! It usually runs every second and fourth Saturday. The class is great for the casual beer lover, budding brewers, or even as fun ice-breakers and team-building exercises for coworkers.